Wacom is introducing a new line of mobile computers with updated pen technology for on-the-go professional creators. MobileStudio Pro provides “an unparalleled feel and accuracy” to any creative session and users will delight in the results they achieve. 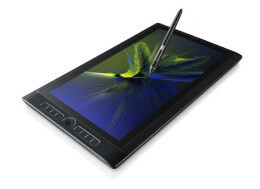 It features the newly-designed Wacom Pro Pen 2, with four times higher pen accuracy and pressure sensitivity than the company’s previous professional pen, enhanced resolution, leading-edge graphics, excellent colour performance, 3-D camera and other innovations. The price for a 13.3″ MobileStudio Pro computer starts from $2,649 and it also comes in a 15.6″ version. There are five configurations to choose from. Three 13.3″ models combine maximum mobility with high performance and colour accuracy and two 15.6″ models deliver a larger work area, 4K resolution, high colour performance as well as superior NVIDIA® Quadro® graphics. Bundled with Windows® 10, MobileStudio Pro has the power professional creatives need to run industry-standard applications such as Photoshop® and Illustrator® as well as demanding 3-D creative software applications.